GEORGIA SPIDER WEB. 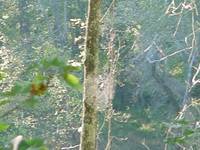 There's a spider in the middle of this web, spun between two trees on the banks of the Chattahoochee River near Atlanta. I couldn't quite capture in this photo the way the evening sun was shining through the web.